For those wanting to explore the heights of Dominica, below is the list of Dominica hikes which indeed makes Dominica the Nature of Isle of the Caribbean.Dominica is the home of the second largest Boiling Lake and famous for it 365 rivers. 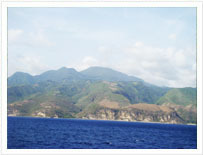 Browse our Hiking Tour for Cruise Ship Passangers here, The Dominica Most Caprivating Hiking Tour. We begin our journey with a drive up Roseau Valley, full of panoramic landscape views.After about 25 to 30 minutes we should arrive at the parking area where we begin our hike to the Middleham Falls, located in the rainforest of the Morne Trois Piton National Park. Morne Trois Piton also cover a few other Dominica Hikes. 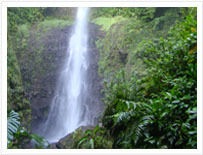 It will take us about 45 minutes to get to the waterfall.The trail is well maintained but can be rough in certain parts as it rise and fall its way through the rainforest. The Middleham Falls is approximately 282 feet high with its waters rumbling down into the pool at its base. A dip into the pool is recommended. 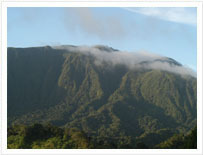 Morne Diablotin is the tallest mountain on the island of 4,747 ft elevation. The hike begins at the cyndicate national park, just about 1 hour drive from the island capital.The hike is approximately 6-7 hours round trip, and is classified to be one of the strenuous Dominica Hikes.The trail goes up to the rain forest, where one will have the chance to see Dominica’s native Imperial parrot know as the sisserou Parrot along with other birds. On a clear day, one will have the chance to see the beautiful views as one hikes to the top. Morne Trios Piton is the Second largest mountain on the island of approximately 4,500 ft elevation.The mountain contains steep hills and this hike is classified to be one of the strenuous Dominica Hikes.One will have to be in good physical condition to hike this trail. 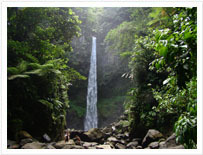 The hike to the Sari Sari falls is about 45 minutes hike and is located in the southeastern part of Dominica in the village of La-Plaine, an hour and fifteen minutes drive from the Roseau the capital. This of Dominica Hikes where, one will have cross the rocks of the river and its advised to follow the instruction of the tour Guide. It’s highly recommended to take a swim here at the falls. 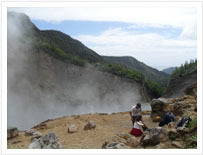 Located in the southeast the village of Delices is one of our 12 water Falls, the Victoria falls. An hour and a half drive from the capital takes you there.A 20 to 30 minutes hike ends at the Victoria Falls which is feed by the white river which flows from the boiling lake. 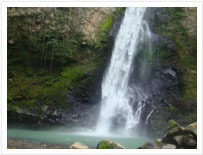 If one is physically fit, one may do these both Dominica hikes in one day, Sari Sari Falls and Victoria Fall. At the falls one is encourage swimming in the pool below.